MASTER OF DESIGN (AUS) (Bay or Brown 2005-Stud 2012). 7 wins to 1300m, ATC TJ Smith S., Gr.1. Sire of 121 rnrs, 67 wnrs, inc. SP Miss Wahoo, The Mitigator, Creative Genius, Creativity, Kinetic Design and of Bennelong Dancer, Jaminzah, Grand Design, Greyworm, Lakeshore Eagle, Port Vale, Cranbrook, Knight Commander, Party Planner, Senor Gaudi, Star of Patch, Swiss Design, Vin Fiz, Deal Master, Gucci Guccimo, Incision, Masterati, Designer Maid, etc. Greyworm (g. by Master of Design). 3 wins. See below. Ingels (g. by Master of Design). Winner at 1000m in Aust. Tycoon Mikado. 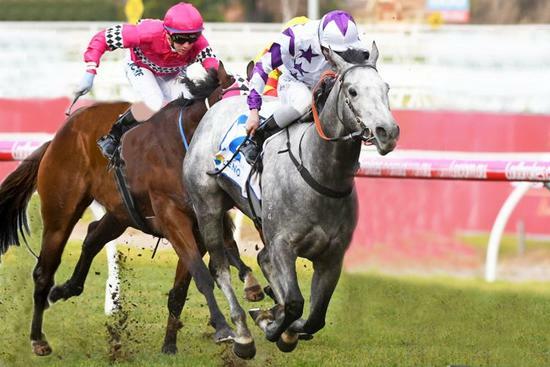 Winner at 1200m in 2018-19, Perth Racing Schweppes P., 2d WATC Crown Perth P., 3d Perth Racing Events at Ascot H.
Miracle Magic. 4 wins. See above. Play Hard. 2 wins at 1300m, 1600m in 2018-19 in Aust. Rubymay. 5 wins to 1200m, A$85,750, to 2017-18 in Aust. STORM AT MIDNIGHT, by Thunder Gulch. 3 wins-1 at 2-at 1300m, 1600m, A$77,120, MVRC Camp Australia H., Zonda H., 2d SAJC The Truth H., 3d VRC Ten News H. Half-sister to Campbell Fever (dam of WOPPITT), Tosamba, Tirumani (dam of ASTRODAME), Midnight Ballet (dam of ROCK CLASSIC). Dam of 8 foals, 4 to race. Tosamba (Woodman). 4 wins to 1400m, A$138,460, VRC AFL Life Members H., MRC Veneda H., 3d VATC Blue Diamond Prelude (c&g), Gr.3, SAJC Queen Adelaide S., L.
WOPPITT (Danzero). 5 wins-2 at 2-at 1000m, 1050m, A$252,824, SAJC South Australia S., L, MVRC Pulse Pharmacy H., 2d MRC Quezette S., L. Producer. ASTRODAME (Flying Spur). 4 wins from 1200m to 1600m, A$515,925, MVRC WH Stocks S., Gr.2, 2d MRC Angus Armanasco S., Gr.2, VRC Frances Tressady S., Gr.3, MRC Autumn S., L, 3d VRC AV Kewney S., Gr.2, Rose of Kingston S., Gr.2, Matron S., Gr.3, MRC Tranquil Star S., Gr.3, Boronia S., L. Producer. CANDIKA (Sebring). 5 wins-2 at 2-from 1050m to 1600m, A$449,400, BRC Princess S., L, 2d BRC Mode P., L, 3d GCTC Magic Millions 2YO Classic, RL. ULMANN (Sebring). 7 wins from 1200m to 1600m, A$621,850, to 2017-18, MRC Moonga S., Gr.3, VRC Paris Lane H., L, 2d Sunshine Coast Guineas, Gr.3, 3d MVRC Schweppes Crystal Mile, Gr.2, BRC Sprint H., Gr.3. MAHISARA (More Than Ready). 7 wins-3 at 2-to 1500m, A$528,890, MRC Sandown S., Gr.3-twice, Qld Tatt's RC Australia Post S., L, 2d BRC Sprint H., Gr.3, VRC Hilton Hotels S., L, 3d BRC Sires' Produce S., Gr.2. Sire. Race Record: 6 Starts 3-2-1 A$136,150. 3 wins at 1200m, 1400m, A$136,150, to 2018-19, MRC Le Pine Funerals H., MVRC Mary Walker Memorial H., MRC (Mornington) Handyman Steel Supplies P., 2d VRC World Horse Racing Trophy H., MVRC Otis Foundation Sprint H., 3d MRC Keno Replay H.